We have uploaded new photos of New York and Virginia ( included the Walton Museum ). See our photo gallery and enjoy ( button Waltons Mountain). ....... and another year is almost gone. We want to thank all the friends of the Waltons and visitors of our site for your support, suggestions and for your positive feedback. It is a pleasure to carry on. We look forward to the coming year. In 2012 The Waltons will celebrate the 40th Anniversary since the first broadcast in 1972. Let us simply be surprised by the planned celebrations .....! Our little report of the 40th Anniversary of The Homecoming event in Jersey City is online now ( Waltons Reunion). Here are The Waltons cast members on TODAY Show this morning. Enjoy ! Click on options for a full screen view ! Celebrating the 40th anniversary of THE HOMECOMING ! The Waltons cast members on NBC´s TODAY Show on Friday 2nd of December ! Tune in about 8 am. Don´t miss it ! 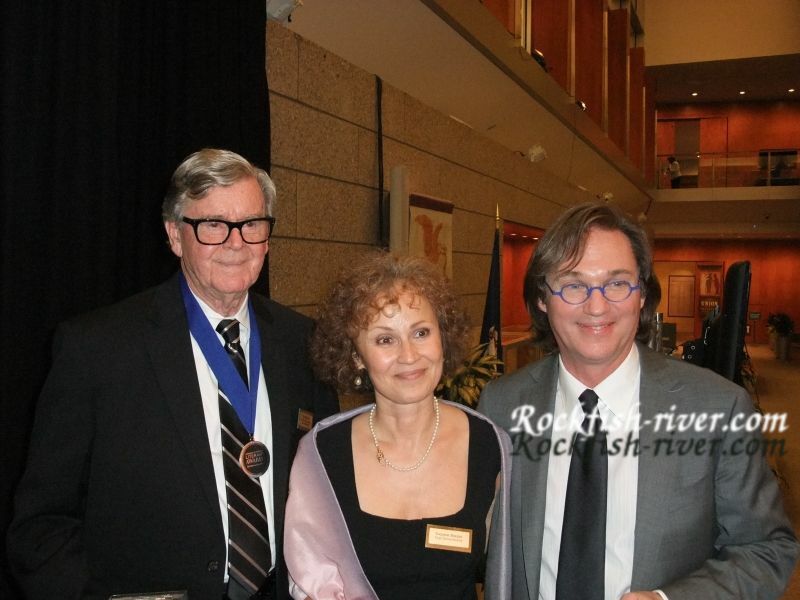 We have added more photos of the Reunion 2011 in Lynchburg, Virginia. Check our photo gallery in "Waltons Mountain" ( click to enlarge ). On our way to Schuyler we discovered a small antique shop, which offers a lot of beautiful things from the old days. If you ever will be in that area maybe you would like to visit the shop - we highly recommend Beth's shop. We bought this little old oil lamp in her shop. More photos and the address see here: "Waltons Mountain - Route 6 Country Store" . The 40th Anniversary of the movie "The Homecoming" will be celebrated December 2nd at The Landmark Loews Jersey Theatre in Jersey City, New Jersey . Here you can find more Photos of the Awards Celebration of October 14th and 15th, 2011. After several exciting weeks in the U.S. we have been returned home. We got extraordinary impressions at the award ceremony for Earl Hamner and it was a great pleasure meeting him and Richard Thomas in Richmond. Likewise, the fan meeting in Lynchburg with four cast members from the Walton family was so wonderful and unique to us, as well as a visit to a dear Walton friend in her old farmhouse in North Carolina a few days later. All the impressions we will reflect a little bit later in a travel review on this site. Jon Walmsley has been interviewed by Patrick O´Brian from the Walton Mountain Museum in Schuyler, VA. Here you will find a reprint of this interview with friendly permission from Patrick and Jon and Marion Walmsley. New photos of the Walton Reunion 2011 / Saturday you will find here. Here are the first photos of the Walton Reunion 2011 / Friday. Earlier today we arrived at the Kirkley Hotel in Lynchburg, Virginia. All is still quiet here. This afternoon, Carolyn Grinnell will also arrive here. And Jon Walmsley, Mary McDonough, Eric Scott and David Harper are on their long way from California to the East Coast. Tomorrow we will finally get to know them personally. Of course, we are here again with our camera and will post new photos as soon as possible on our website. 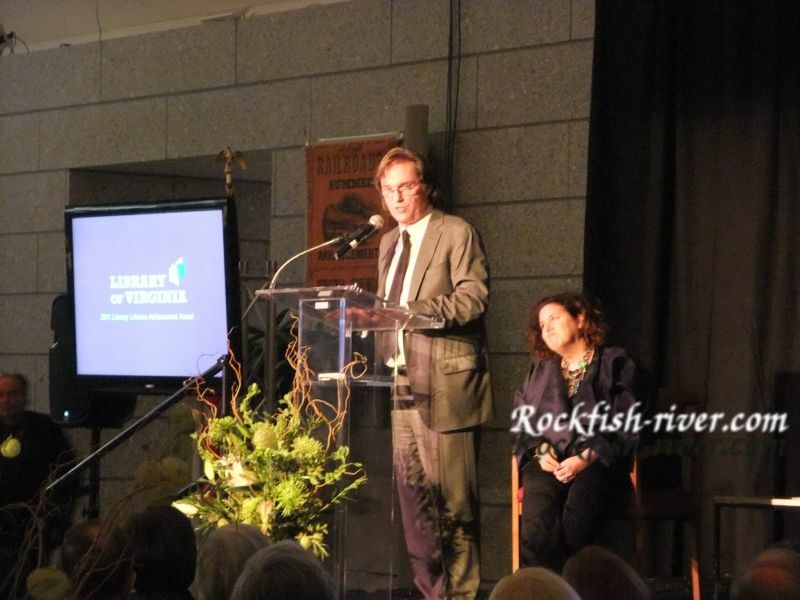 Here you can find more Photos of the Awards Celebration of October 15th, 2011. Last night the great author Earl Hamner received his Lifetime Achievement Award in Richmond, presented by Richard Thomas. John-Boy meets John-Boy! has a lot of details. Check it out. Michael Learned has her own website now. Go to "Links" where you will find the link to her site. This year we celebrate the 40th anniversary of the film "The Homecoming" by Earl Hamner. Some festivities which accommodate the impact of the movie "The Homecoming" are planned. 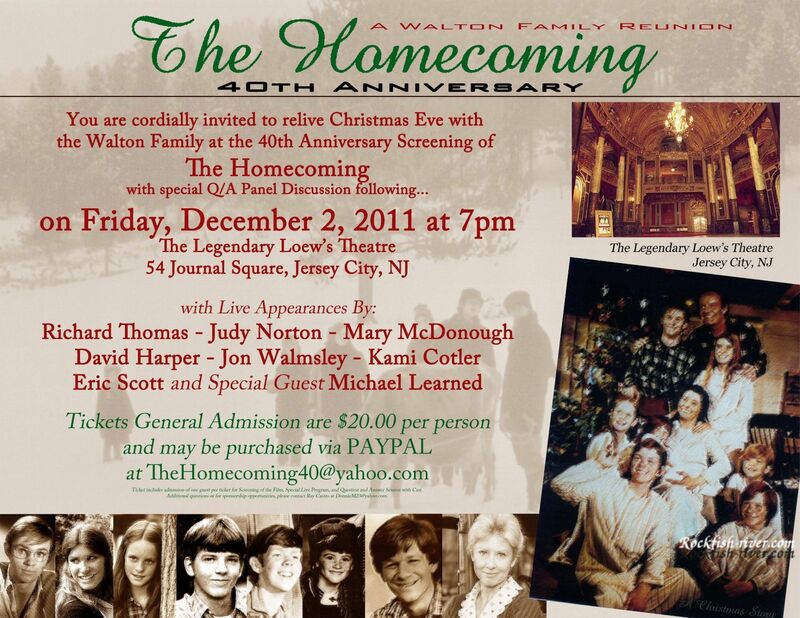 "The Homecoming" is seen as a precursor of the TV show "The Waltons". After the film had appeared very successful on TV in 1971 the TV show "The Waltons" had started in 1972. 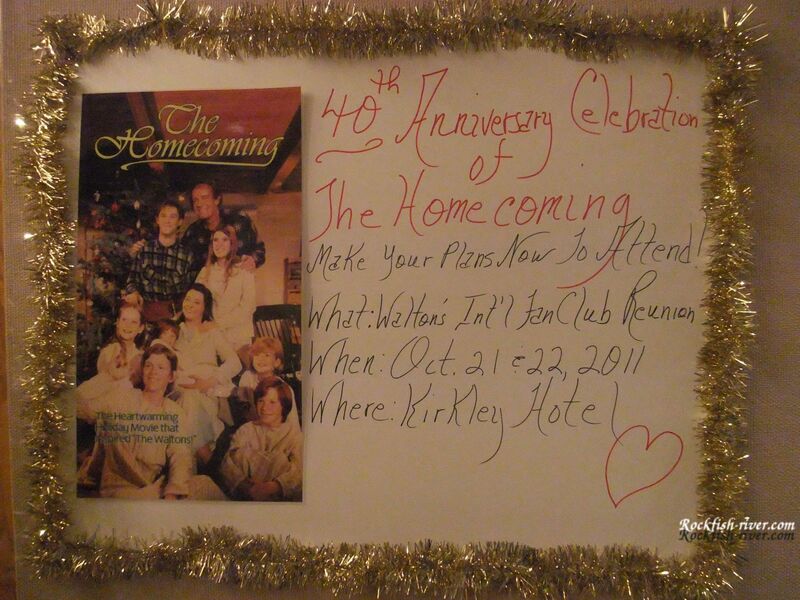 The motto of the next Walton reunion in Lynchburg, Virginia on October 21 and 22 is the movie "The Homecoming". The film is set during the Christmas time and also the fan meeting will become an early Christmas celebration, with Christmas tree, Christmas decoration probably also with Santa Claus. This year's guests of honour will be: Mary McDonough, Jon Walmsley, Eric Scott and David Harper. We are very lucky to be able to take part in this celebration again and we will report on the Reunion. On 2 December, at The Landmark Loews Jersey Theatre in Jersey City, New Jersey (near New York), an event will held to celebrate the 40th Anniversary of the movie "The Homecoming". Guests of honor are here Richard Thomas, Jon Walmsley, Eric Scott, David Harper, Mary McDonough, Kami Cotler, Judy Norton. Michael Learned as a special guest has been announced too. Besides the film screening of The Homecoming will be a question and answer session with the cast members. 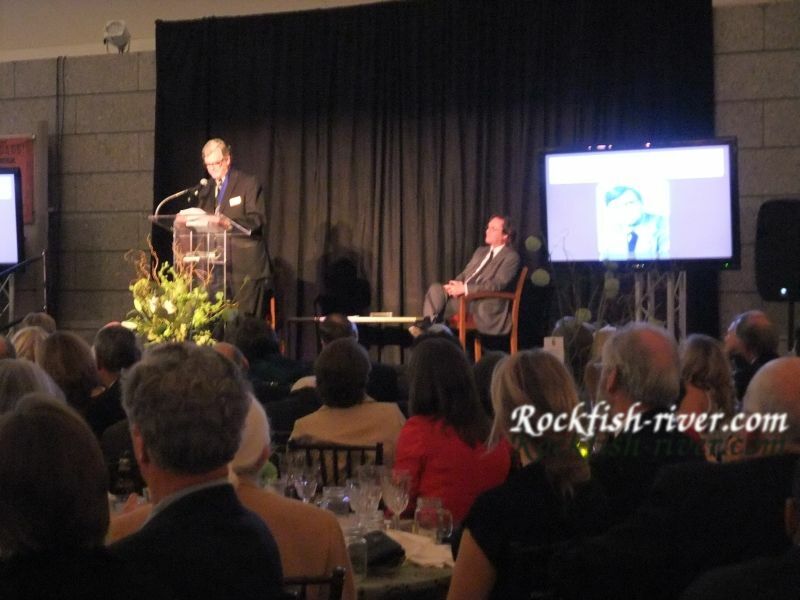 Richard Thomas will be presenting Earl Hamner, Jr. his Literary Lifetime Achievement Award on October 15, 2011 at the 14th Annual Library of Virginia Literary Awards Celebration. We are sure this will be a very special moment. Mary McDonough and Richard Thomas met in New York on October 8th to introduce Mary's book to the New York audience. Here we have a short report and a couple of great pictures of both of them. It seems as if they had arranged things regarding the clothes . Richard Thomas looks fantastic! He doesn't look like his age (60 years). Special news for fans of Grandpa Walton, on INSP "T he Waltons Zebulon Marathon" will begin on Saturday, September 24th at 7:00pm ET. On INSP "The Waltons Fan Favorite Labor Day Marathon" will begin this Monday (Sep 5th) at 1pm ET. On January 25th between 08:00 p.m. (EST) and 10:00 p.m. (EST). Our provider has scheduled a maintenance window. This could lead to a restricted availability of our website for a short duration. Thursday September 08, 2011 at 7 p.m. Mary McDonough will present her new book "Lessons from the Mountains" in New York. Mary will be accompanied by her “brother John-Boy” Richard Thomas. This might be a very special moment to watch both wonderful actors together again. If anyone of you has the opportunity to attend this event we would appreciate to get a picture of Mary and Richard. We are happy to publish the photo on our site if you don´t mind. Please notice: the deadline for your registration and the payment is August 17, 2011 !!! Below you can find an interview with Mary McDonough (Erin Walton). She talks about her life and her book "Lessons From The Mountain". 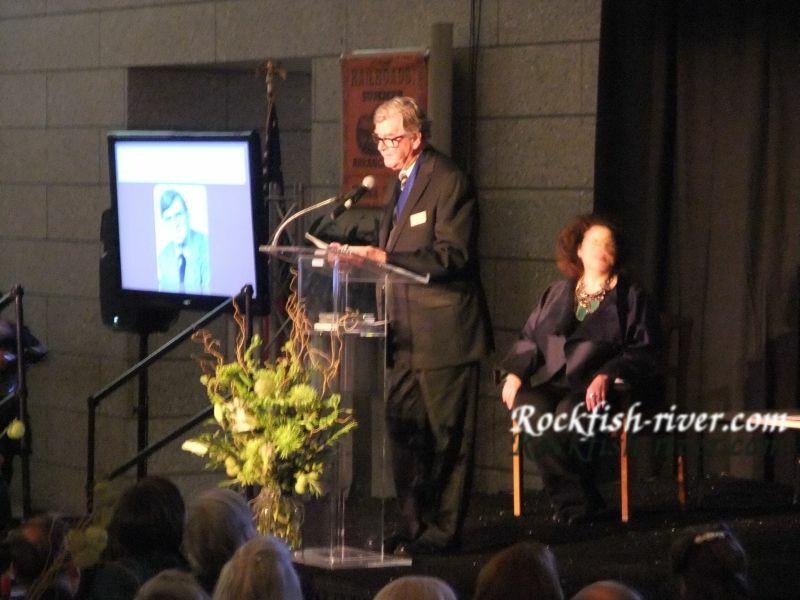 The Library of Virginia recently announced that Earl Hamner will receive the 2011 Literary Lifetime Achievement Award at the 14th Annual Literary Awards Celebration on October 15, 2011. Congratulations and Thank you Earl Hamner for creating such a wonderful show. After returning from our vacation we found a lot of new guestbook entries and emails from you. Thank you for it ! We will answer you in the next few days. Mary and Don on Cloud No. 9 ! Big surprise for everybody ! Last Saturday at her belated birthday party for her 50th birthday Mary McDonough and her longtime boyfriend Don tied the knot. Some of her Walton family shared this wonderful event: Michael Learned (Olivia Walton), Judy Norton (Mary Ellen), Jon Walmsley (Jason), Eric Scott (Ben), David Harper (Jim Bob) and Earl Hamner. That must have been a great party. Wish we could have been part of it. Thank you Mary for sharing this photo with us ! Waltonfriend Mark joined the book signing event with Mary McDonough in Schuyler, VA on May 14, 2011. He was so friendly to share his photos with us. Here you can find his photos and a local report about the event. Thank you Mark for sharing your photos with us ! Below you can find the Reunion News of the Reunion 2011. On Gospel Music Channel (gmctv.tv) "The Walton's Mothers Day Marathon" will begin this Sunday (May 8th) from 11am - 11pm ET. Included in the marathon will be a back-to-back feature of "Mothers Day on Waltons Mountain" starting at 7pm. Thank you Chris from GMC for the information. Have fun with the Walton's Mothers Day Marathon! Earl Hamner's latest book is available, "Odette: A Goose of Toulouse". The book can be ordered from Amazon, Barnes&Noble, Bear Manor Media. This is a wonderful book for all ages. We added a new Button " In Momery of " . Last Saturday (April 16th) Mary McDonough had her first book signing event in Los Angeles. Mary was supported by her "Walton family". Her "parents" Michael Learned and Ralph Waite and her "siblings" Judy Norton, Kami Cotler, Jon Walmsley, Eric Scott and David Harper joined the event. Wow, what a wonderful afternoon. We wish we could have been there! Here you will find a report along with beautiful pictures of the event. The Walton Reunion Special will be re-run on April 3rd. 01:30am(ET) and April 4th. 1:00am(ET) on INSP Network. On INSP Webpage you can find new videos from Fans of the Waltons at the Waltons Reunion 2010 in Schuyler. A Walton Easter, April 3 at 7 & 9 pm et; Marathon continues at 11 am. THE WALTONS WILL BEGIN AIRING ON March 21th. (3 p.m.- 5 p.m.) on Hallmark Channel. Mrs. Michael Learned is doing a new play. It is called "Southern Comforts". You can watch it from March 15 - April 10 at The Center Theatre, 300 East Ocean Blvd., Long Beach, CA. Click here and you will get all the information. May 11th 2011 at 6:00 pm Washington, D.C.
May 14th 2011 at 1:00 pm Schuyler, VA. The Walton's Mountain Museum in Schuyler is now open for the 19th Season! "How sad it was to hear of the passing of our dear and precious friend, Ms. Peggy Rea. She passed away on February 5th. As an actress, she was known by many names, but to me she was our dear "Rose" on The Waltons. In January, I talked with Ms. Peggy. She was so excited about her upcoming 90th birthday on March 31st. She said all she wanted for her birthday was lots and lots of birthday cards and notes. Feeling her excitement, I decided to plan a birthday card shower for her. Sadly, she passed away before we could celebrate her birthday. I recently talked to Peggy's good friend and I shared with her what I had planned regarding the card shower and how sad I was that we couldn't do it. Her friend suggested we send birthday cards anyway. So we are celebrating the life of Ms. Peggy by sending birthday cards and notes which will be on display at the cemetary on February 28. I know this will be of comfort to Ms. Peggy's relatives and friends as we share our love and appreciation for her. I hope we get an overwhelming response with the cards. This is a very unusual and very nice idea. We hope many of you will send birthday cards for Peggy ! On 5th of February 2011 actress Peggy Rea died in the age of 89 years at her home in Toluca Lake, California. Peggy Rea will be remembered as Rose Burton, a relative of Olivia, who moved in with the Waltons accompanied by her grandchildren Serena and Jeffrey. All three provide plenty of excitement at the Waltons. Peggy Rea appeares in The Waltons for the first time in the 8th Seasons. Peggy Rea was born March 31, 1921 in Los Angeles. She started her career as a production secretary at MGM. In 1947 she moved to New York to act on stage even on Broadway. to act on stagetottto Since the 50s to late 90s Peggy Rea had been a busy actress. In addition to the Waltons she appeared also in many other well-known series such as Grace, The Golden Girls, Charlie's Angels, The Dukes of Hazzard or All in the Family . Peggy Rea also played various roles in several film productions. Good night, Peggy Rea ! We added 3 photos of the Waltons Mountain Country Store (taken in 1993 / 1994) and a Weather overview of Schuyler ( Button "Waltons Mountain - Weather" ). On January 26th between 06:00 p.m. (EST) and 01:00 a.m. and January 27th between 06:00 p.m. and 01:00 a.m. (EST). our provider has scheduled a maintenance window. This could lead to a restricted availability of our website for a short duration. We added some photos of the Blue Ridge Mountains und the Great Smoky Mountains in our photo gallery ( Button "Waltons Mountain" ). to all the fans of the Waltons and to all visitors of our website. We are looking forward to all the news about "our Waltons" .